Lenticulae hint at activity beneath Jupiter's icy moon. Reddish spots and shallow pits pepper the ridged surface of Europa, a moon of Jupiter. The dark spots are called "lenticulae," the Latin term for freckles. Mineral-rich, rust-colored ice erupting onto the surface to form lenticulae may hold clues to the composition of the ocean beneath, and whether it could support life. 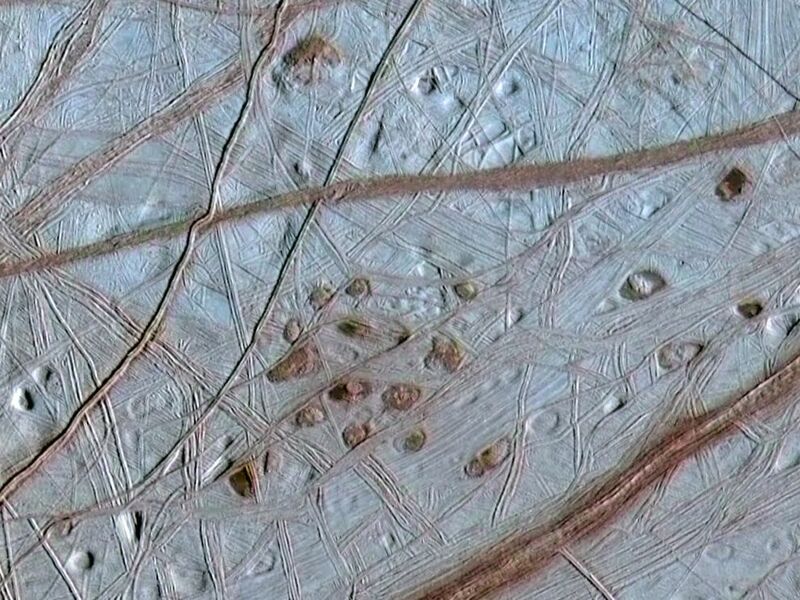 The spots and pits visible in this region of Europa's northern hemisphere are each about 10 kilometers (6 miles) across. The dark spots are called "lenticulae," the Latin term for freckles. Their similar sizes and spacing suggest that Europa's icy shell may be churning away like a lava lamp, with warmer ice moving upward from the bottom of the ice shell while colder ice near the surface sinks downward. Other evidence has shown that Europa likely has a deep, melted ocean under its icy shell. Ruddy ice erupting onto the surface to form the lenticulae may hold clues to the composition of the ocean and to whether it could support life. (plural: lenticulae) dark, reddish-colored spot visible on Jupiter's moon Europa.